Celebrated Palestinian poet Mahmoud Darwish has delivered a stinging attack on the rival factions, Hamas and Fatah. He described June's violence in Gaza as a suicide attempt in the streets. Mr Darwish was delivering a lecture in Haifa, his first public appearance in Israel in more than 35 years, which was broadcast live on Arabic satellite TV. He said that the two warring factions had made the possibility of establishing a Palestinian state far more unlikely. The reading by Darwish, who is famous throughout the Middle East and regarded as the Palestinian national poet, came a month after deadly clashes between Fatah and Hamas in the Gaza Strip. The violence has split the Palestinian territories in two, with the militant group Hamas in control in Gaza and Fatah, led by Palestinian Authority President Mahmoud Abbas, in charge in the West Bank. "We became independent," Darwish said mockingly. "Gaza became independent of the West Bank, and for one people, two countries, two prisons." Darwish, who was born in a village near Haifa, also criticised Israel for not taking advantage of what he saw as historic opportunities for peace. 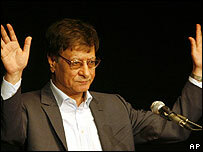 It was Darwish's first poetry reading in Haifa since he left the port city in 1970 to study in the former Soviet Union. His poetry has been translated into more than 20 languages, and he has won many international prizes for his work.